Companies are developing a crypto token that represents carbon credits to be traded on a blockchain ledger, creating a more efficient and transparent method for exchanging the valuable certificates tied to reducing greenhouse gas emissions. With blockchain technology showing up in everything from global shipping to cloud storage and real estate transactions, it's no surprise that it's now seen as a way to help companies trade and sell carbon credits. Blockchain, the electronic ledger technology underpinning bitcoin, has been used to address pollution and energy consumption in the past; now it appears poised to attack global warming and deforestation. Earlier this month, IBM announced it's working with environmental fintech company Veridium Labs Ltd. to tokenize carbon credits, which are used to incentivize companies to pollute less. The tokens could be traded on a distributed, open-source blockchain exchange run by start-up Stellar. And this week, Ben & Jerry's ice cream announced it has partnered with the non-profit Poseidon Foundation to pilot the use its blockchain platform to allow consumers to offset their carbon footprint by applying a portion of retail sales to purchase carbon credits. In doing so, consumers can literally reduce their own carbon footprint's impact on the environment. 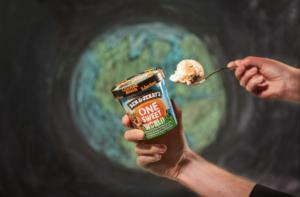 For each scoop of Ben & Jerry's ice cream sold at its shop in London's SoHo district, a penny will be paid toward the purchase of a carbon credit that's traded on Stellar's blockchain-based exchange. Customers can also volunteer an additional penny at the point of sale toward the purchase of a carbon credit. Poseidon's blockchain is expected to leave pilot stage and go live in June 2019. IBM will act as both a technical advisor to Veridium and a blockchain service provider. It expects the crypto token to go live in the second half of this year. IBM and Veridium are still in talks with regulators, who will determine what kind of instrument the tokens represent (i.e., a security or a commodity). "That regulatory treatment of the instrument will then inform who and how individuals and/or corporations are eligible to buy it," said Jared Klee, IBM's blockchain offering manager. The tokens will represent a portion of carbon credits, which are issued by governments under cap-and-trade programs set up over the past decade or so to limit the amount of carbon dioxide or other greenhouse gases companies emit. A carbon credit is equal to one metric tonne of carbon dioxide, so companies that emit fewer greenhouse gasses and thereby underuse their allotted credits can trade them privately or on exchanges to others expecting to exceed their limit. The purpose of cap-and-trade is to push companies to reduce their greenhouse gas emissions by "capping" the amount they can emit and allowing them to "trade" excess credits. Carbon credits worldwide are traditionally traded en masse in carbon markets. The process of calculating carbon emissions and trading credits, however, can be a manual, time consuming and expensive process. Often, firms pay outside accountants or in-house teams to account for carbon emissions over a year. Sometimes, two teams evaluating the same carbon impact can come up with different numbers. "Our work with IBM is the first step in dramatically simplifying the accounting and offsetting processes, and therefore ultimately helping reduce costs," Todd Lemons, CEO and co-founder of Veridium said. Through the use of a permissioned blockchain, the use of fossil fuels could be tracked at the same time carbon credits are traded. "What we're building into a token is an accounting methodology to automatically calculate the carbon footprint as well as with the design of the token creating an instrument we anticipate can be exchange traded," Klee said. "We hope that opens up a world of opportunities not only for companies to buy these and immediately use the carbon credits, but so that a company can perhaps anticipate what their upcoming environmental impact activities will be this year and purchase tokens as a hedge." Initially, Veridium Labs' "verde" tokens will represent carbon credits held by its sister company, InfiniteEARTH. That company runs a 250-square-mile Indonesian rainforest reserve for which it receives highly valuable REDD+ carbon credits that are tied directly to deforestation prevention. Deforestation – the clearing of forests and green areas – is responsible for more carbon emissions than the sum total of all cars and trucks on the road. The purpose behind REDD+, which stands for Reducing Emissions from Deforestation and forest Degradation, is to make trading carbon credits more valuable to corporations than developing large swaths of rainforests -- typically by burning the trees. A blockchain-based ledger that allows carbon credit data to be freely shared among corporations would go a long way toward reducing complexity, Klee said. "For credits like REDD+, it's strictly over the counter," he said. "There's no central market place. These are not exchange traded. As a result, there's a lot of friction involved in trying to purchase them and use them to offset a carbon footprint. That challenge is even more painful when you have to go through the accounting process to determine your carbon footprint in the first place." While InfiniteEARTH holds a finite number of carbon credits that can be represented by digital tokens, IBM and Veridium hope to build out a much larger carbon credit market as industry participants increase, Klee said. "Veridium and its sister company is trying to solve a market problem of how to make it easier and cheaper for companies – and eventually individuals – to offset their environmental impact, and certainly part of that has to be a solution that allows others to do it as well," Klee said. The blockchain exchange will create trust, Klee said, through transparency in trading since anyone on the permissioned electronic ledger will be able to verify the carbon credits exchanged. In terms of carbon credit trading, the two biggest markets in the U.S. are the Regional Greenhouse Gas Initiative (RGGI), representing fossil fuel power generating plants in the Northeast and Mid-Atlantic regions, and the California Cap and Trade, which represents industrial facilities and power plants and is second in size only to the European Union's Emissions Trading System. The RGGI, formed in 2008, was the first U.S. mandatory cap-and-trade program for greenhouse gas emissions; the California Cap and Trade operates one of the most active carbon credit trading markets in the world. "My concern for the U.S. is that RGGI and...California [Cap and Trade] are really the only two relevant markets. Any emissions market in the U.S. will have to be run and supported by the states," said John Villali, a research director for IDC Energy Insights,. "The current administration has killed the Clean Power Plan and has halted any EPA climate change efforts." As for the Midwest and Southern states, such as Texas and Oklahoma, there are plenty of coal plants and gas and oil producers "who would have no interest in participating in any emissions market," Villali said.